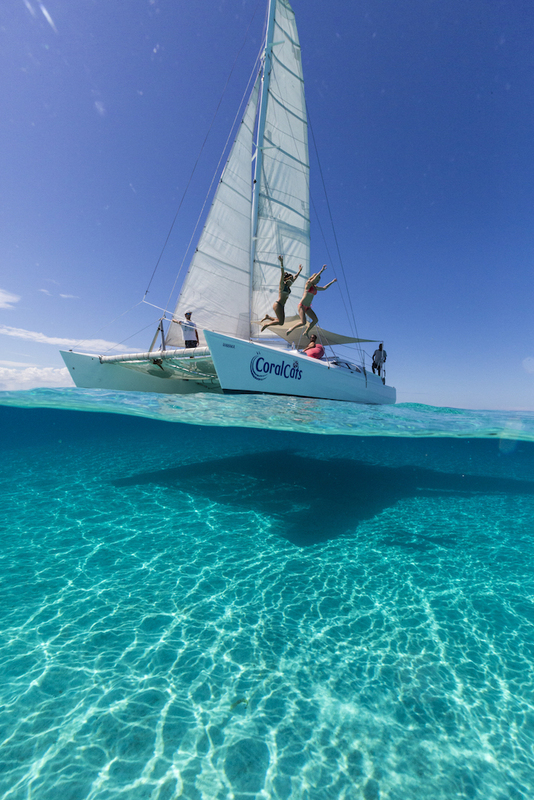 Corals Cats Sailing, Day sail Snorkel Cruise. Our day begins at 9.30am at Port Denarau, the exciting central hub for marine activity in Fiji. 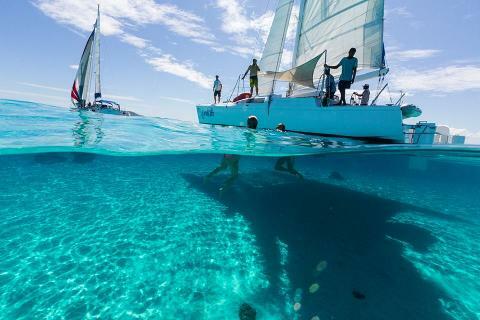 Once we’re all aboard we can drop the lines, hoist the sails and leave the busy main island for our ultimate Fijian day out on the water. Relax on Wanaka’s spacious decks or under the sunshade as we glide effortlessly over the aquamarine waters towards the magical islands of Malolo Lailai , Tavarua, Namotu and out to the outer reefs. Our professional local crew will entertain and inform, with their knowledge of the local marine life, history and folk law. Look out for dolphins, turtles, flying fish and seabirds. the trimmings is laid on. An ice cold Fiji bitter, a refreshing cocktail or fresh fruit juice can be purchased from the world famous Island bar. Then there’s time to relax on the beach, swim, or stroll along the white coral sand around Musket Cove and Plantation Island resorts. With the South East trade wind filling in it’s time to weigh anchor, hoist the sails and again experience the magic of a performance sailing catamaran as we head back towards Port Denarau. If conditions permit the crew are happy to let you try your hand at steering the boat or trimming the sails. Return to Port Denarau by 5.30pm. Complementary Transfers from Denarau and central Nadi Hotels only. Other areas, transfer service available at guests cost depending on location. Camera & light sweater for windy or cool days.